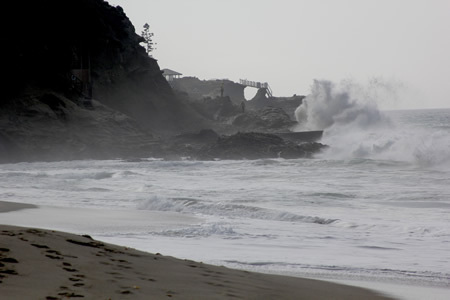 Guards search the southern cave on Thousand Steps Beach in February for a teen swept into the sea by high surf. Photo by Andrea Adelson. Hundreds gathered in May to pay tribute to Kathleen Blackburn’s civic accomplishments, character and athleticism. 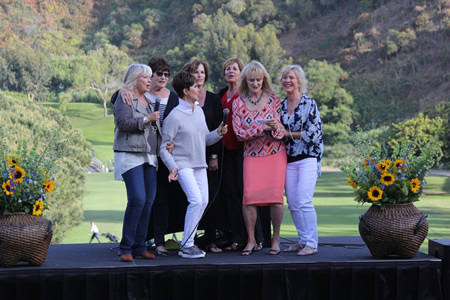 Less well known was Blackburn’s love for pop lyrics, but friends, from left, Judy Blossom, Gay Sutherland, Carol Ann Berryman, Karen Gilbert, Shirley Torrance, Diana Gairdner and Jeanne Jones, provided a soundtrack. Blackburn, 71, who served Laguna Beach from 1992-00 on the City Council and Planning Commission, including two terms as mayor, died March 16. 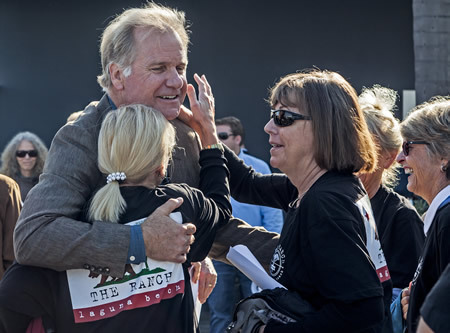 Locals trek to Santa Monica to show their support for Mark Christy at a Coastal Commission hearing in January contesting approval of renovations at The Ranch at Laguna Beach. 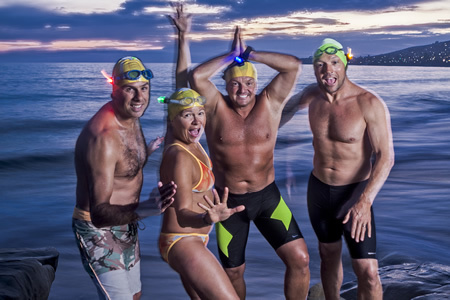 Members of the 33.5 channel team, from left, Brett Rose, Lynn Kubasek, Thomas Hale and Roddy Teeple, in July dive in for a night workout before swimming the Catalina Channel in August. Photo by Mitch Ridder. 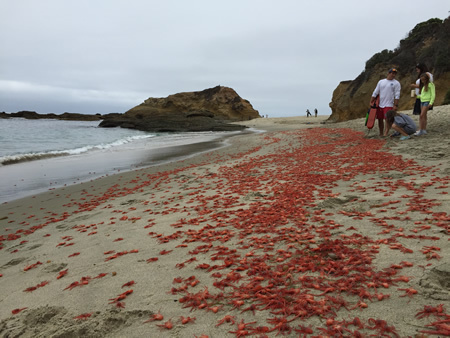 Laguna Beach lifeguard Nicholas Lerario talks to visitors about the unusual influx of tuna crabs at Goff Beach near Treasure Island in June. Photo by Tom Cantrell. 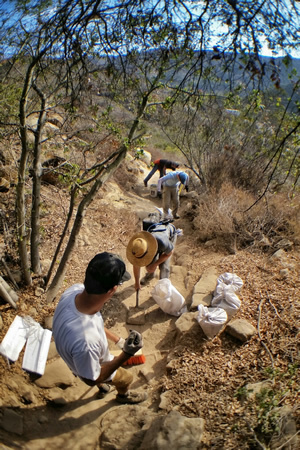 Canyon Foundation staff Mike Hall and Alan Kaufmann work with volunteers in August making trail repairs on the Laguna Ridge Trail near Big Bend. Photo by Bill Freeman. 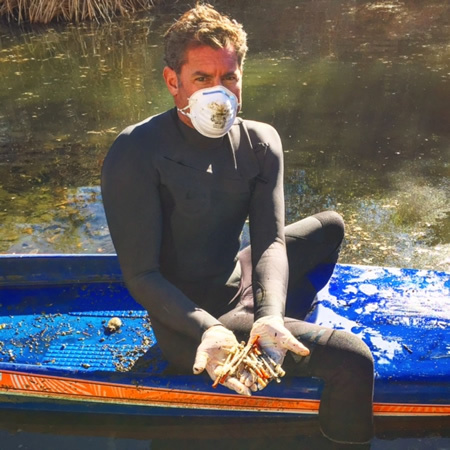 James Pribram and other volunteers for his Eco Warrior Foundation fish out garbage in December from the Aliso Creek watershed. 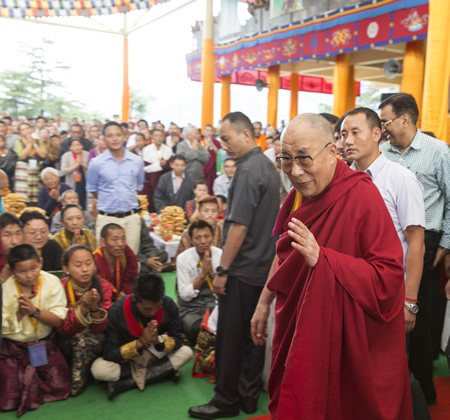 A celebration took place in India for the 80th birthday of the Dalai Lama, who returned to Orange County July 5-7 for a visit. Photo by Tom Lamb. 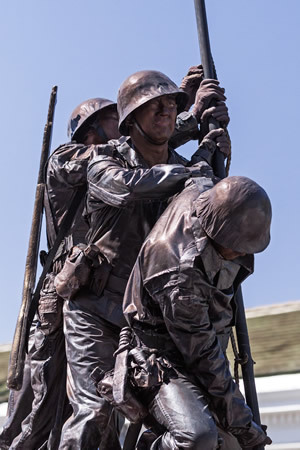 The Pageant of the Masters won the President’s Theme Trophy with its entry recreating the Marine Corps memorial with six live actors depicting the servicemen who raised the flag World War II Battle of Iwo Jima.Photo by Mitch Ridder. Gene Herndon, left, and Francis Pillsbury, right, swab the letter “L” overlooking Laguna Beach High School with a fresh coat of paint in January. Photo by Mitch Ridder. 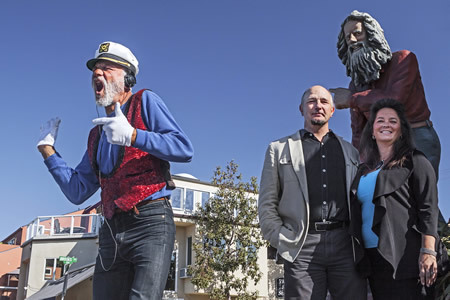 Filmmakers Martin and Tabitha Yewchuk, right, with Michael Minutoli, left, taking up a role inhabited by Eiler Larsen, depicted in a sculpture at Brooks Street and Coast Highway. Photo by Mitch Ridder. 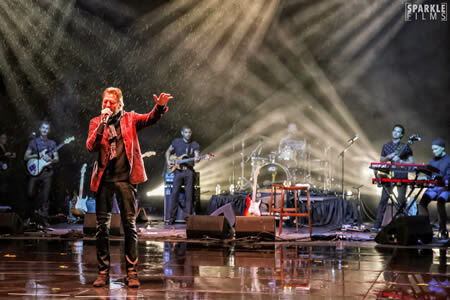 Kenny Loggins steps into the rain from under a sheltering stage during a December concert in the Irvine Bowl. Photo by Sparkle Films. 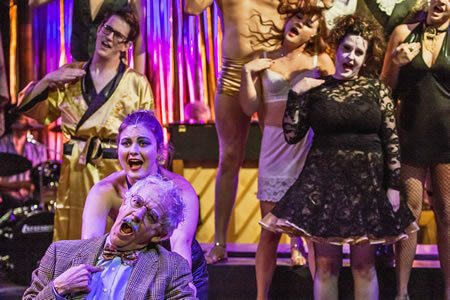 No Square Theater in July revives the cult classic, “The Rocky Horror Show.” Photo by Mitch Ridder. 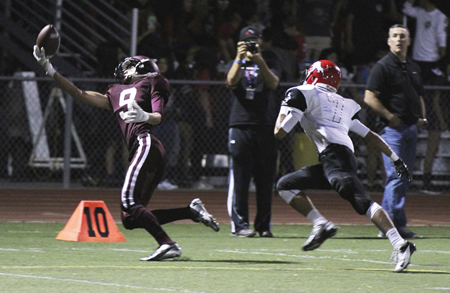 Laguna Beach High School junior Ryan Blaser snags one of five passes for 93 yards and a touchdown during a game against Westminster in September. Photo by Dante Fornaro.